For a few decennia now we have a new phenomenon: crop circles. Is it a hoax? Is it of an alien origin? From the civil point of view we do not know. Some guys named D. and D., who turned out to have contacts with the american and british Intelligence Agencies, undermined in 1991 public belief by stating that they at least made 300 of them since 1978 (against 9000 of them registered all over the world in 1999). On request though they were not able to reproduce any of them to a satisfying degree that could match with the real phenomenon. The guys today maintain a (professional) website instructing on how to make your own circles. Apparently this is an action of legally covering it up (see also a Crash Course on Crop Circles). What do people do being confronted with unknown phenomena? They do whatever they can that is within their scope of control. 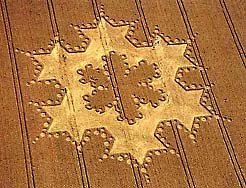 As such there have been divining rods, meditation sessions, healing powers ascribed to circles, interpretations and predictions by clairvoyant people, government cover ups and more peculiar psychological phenomena that all have one thing in common: we do not know how to deal with these strange symbols in the crops. Amateurs have tried to make their own circles and in some instances there was an illusion of communication with the original circle makers. Sometimes very near to a recently manmade circle an alien one appeared that seemed to have some relevance to the former one. But by no means there has been any formal and systematic attempt to take the messages as serious invitations to interact at the symbol level. Of course there are many interpretations of the symbols. Many of the circles are recognized as being alike symbols of celtic crosses and other cultural and spiritual/religious origins (see for a systematic account : Crop circles: The Crop Circular.) Also mathematical patterns like Mandelbrod fractals have been recognized. Other internet sites maintain things like: "The intergalactic language is your language (LANGUAGE OF LIGHT) and it speaks to you from its place outside of you and, of course, its place within you. The symbols are YOUR LIBRARY and you can retrieve that information which you are comfortable with and return the rest." ( from a site that does not want to be mentioned), and give intuitive interpretations of the meanings of these patterns. But still there is a general lack in sincere thinking on how to communicate at this level of symbol management. We seem to be stuck in a psychology of ignorance and denial, mystification and interpretation without ever arriving at the conclusion that we have to formulate an answer to an apparent message from outside our human earthbound realm. In fact humanity is embarrassed: some intelligence is talking to us at a level of symbol-management control familiar to us, but we lack in cultural unity and capacity to say anything meaningful back to them. That other intelligence is trying to speak our language of symbol management and we are only capable of recognizing which of our known symbols match with the ones drawn by them in the crop fields. In fact we, apart from mystifications, lack in any theory of what and why that intelligence tries to communicate to us and what and how we should answer them. Certainly it has not been the intent of the government hoaxers D. and D. to stimulate us in formulating answers in talking back to that unknown intelligence. In fact they programmed to present humanity like a chaotic amateuristic moron to which that intelligence can only answer with a question mark (which actually seemed to have happened in 1990). Psychologically speaking at the level of the collective conscious we lack in selfknowledge of first of all knowing our own symbols of culture (there is no world-order agreement but only ego-culture about it) and secondly we have no idea of what as a collective should be our answer to that other intelligence. There have even been commercial crop circles advertising products like cars or electronics to which those alien intelligences must have pulled their hairs if they had any. 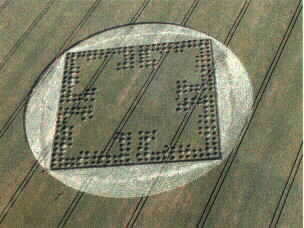 (taken from the B. T. Crop Circle Home Page). These are the worst examples and show rather sloppy irregular patterns of an evidently amateurish nature. Within these circles one could trace human actions as performances with rope and plank and broken stems. None of the above described anomalies were observed in these circles. Nor do these patterns make much sense symbolically, nor do they constitute any mathematical regularity of importance. It looks like children playing crop circle and that is all. 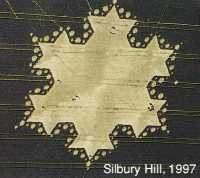 These patterns were observed in 1999 in England and had some of the marks of the genuine thing (but not quite all of them). Still these circles were doubted as they made patterns all too familiar to us. Could the military have made these? The 6/12 divisions make the interpreters uncertain: with these they suffer from our own cultural self alienation with the government cover ups and the idea that aliens could make patterns that are so much alike the international symbol of ecology or the jewish six-pointed star. Of these circles there is no doubt: they are the real ones. They are huge, complex and mathematically interesting and show all the anomalies as was scientifically confirmed to be of the plasma-vortex hand of writing. In this type of circles at times all kinds of modern equipment fails to function while animals refuse to enter them on their own senses for natural deviations. Sometimes the electromagnetic radiation was that strong that several people got nauseous entering them. These circles appeared over several years since the early 80-ties. They are formed perfectly as if programmed by a cop circle computer with the crop laid down in patterns that sometimes could only be explained by having happened all at the same time as if a huge vortexing circle-stamp had imprinted the pattern in the field.